I can’t help you with the XC 5000s, but as for the carreras, a few of my teammates have them and they don’t seem terribly durable. I suppose if you put plastic on the bottom of your cross spikes you’re kind of asking for trouble on that front though. EDIT: The carreras are probably fine on soft courses, but for courses where you really need a true cross spike (ie. those with gravel/pavement), they don’t seem to hold up. Yea I was wondering how durable the plate was on the carrera’s. I can’t say every course I’ll be racing on will be 100% grass, so I was kinda worried about the level of peroformnce on a tougher surface. I may do a little more research into the XC 5000. I’m not the biggest fan of the victory XC so I’m willing to give NB a shot I think. Anyone test out the New Balance XC 5000 this year? Seemed like a pretty elite level cross spike coming from them. Debating on if I should invest in those or the carrera xc. Has anyone owned/worn the Reebok Harrier Ultras I believe they are called. 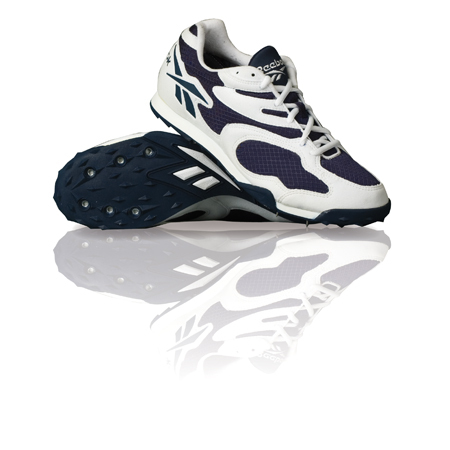 They seem like a scrub spike, but I want to pick up a pair because I never see anyone racing in Reebok and I think it would look pretty rad. They basically look like someone stuck spikes onto the bottom of a pair of dumpy sneakers. those look like javelin or cricket spikes. I’m pretty sure you don’t see anyone racing in those is because you’re not on a 1997 JV track team. They’d probably be better used as golf shoes nowadays. I just think it would be awesome to win a race wearing those, like that kid from SC who won the state meet in Jordans. That might just be the greatest picture to ever reach TrackTalk. The expression on the kid behind him makes the pic. So yeah, raced in victory 2s yesterday for the first time. They’re pretty rad, very similar to OG Vic’s. I liked them much more than I expected I would. Also I ran a workout in eldoret 1s and they’re insanely aggressive. It’s amazing how much more aggressive nike’s older spikes were. Anybody tried the New Balance MLD5000? I really like the look of the spike and I’m wondering if it’s up to Vic/tumbo standards. I know this isn’t what you asked, but for what it’s worth – New Balance’s MD800v2 is awesome. One of the few non-Nike spikes I own. Can be used for anything from 200 - mile, if you ask me. Sold my pair of eldo’s a few months ago but I do remember them being a lot more aggressive than I thought as well. I loved how all of the older spike pates were different iterations of the miler plate. I have two pairs of vic elites and a pair of vic 2s that I’ve been itching to run in, but I’m a long way from getting back on the track at the moment for anything serious enough to warrant using them.